The Catatumbo River in the northeast of Colombia is said to taste like blood. Bodies are found in the river every year; in the recent past many were victims of Colombia’s multisided civil war, one that was at least partially financed by the drug trade. Odds are that if you or someone you know has consumed cocaine, the drug began as a coca plant in the Catatumbo region; it is home to some of the most intensive coca production of the world. Life here has revolved around the crop, and the violence that comes with it, for decades. But now in the rural community of Las Palmas in the Catatumbo, a group of former coca farmers has rejected their old cash crop. With the assistance of Jesuit Refugee Service and the Diocese of Tibú, 41 families in Las Palmas are replacing coca production with legitimate crops in the hope of promoting peace. The success or failure of the project could determine the future of the region and could suggest a new strategy in the global war on drug trafficking. Heading into the Catatumbo region means leaving government authority behind. One passes Colombian Army checkpoints manned by assault-rifle-wielding soldiers, flanked by tanks and armored personnel carriers, as the already potholed roads revert to barely marked trails of rock and dirt. Soon you are in guerrilla territory. The Havana Accords led to the demobilization of the Revolutionary Armed Forces of Colombia (known by its Spanish acronym, FARC), the largest of the country’s leftist guerrilla groups. But despite the high hopes generated by the accord, peace has never truly arrived. The Jesuit Refugee Service today continues to resettle people displaced by violence in the Catatumbo. Today, former FARC units whose members have denounced the peace accords continue to fight. In addition, two rival leftist groups, the E.P.L. and the E.L.N. (the Army of Popular Liberation and the Army for National Liberation, referred to as Pelusos and Elenos), contest much of the terrain in the Catatumbo formerly controlled by FARC fighters. The ideological differences between the groups can seem comically small, but the fighting is deadly serious. The result has been that the government has struggled to establish its authority or provide social services in the Catatumbo. Before the accords, FARC functioned as a proto-state, doing everything from providing basic necessities to cracking down on petty crime. The absence of government control also ensured that coca farmers could continue their production, despite the constant threat of violence. The 2016 peace accords were intended to change all that. In addition to demobilizing the FARC, the accords were meant to offer a way out of coca production to farmers who long depended on it. Farmers were to clear their fields of coca plants. The government was to help farmers plant legitimate crops and to provide subsidies to those farmers until they became able to support themselves. With the assistance of Jesuit Refugee Service and the Diocese of Tibú, 41 families are replacing coca production with legitimate crops in the hope of promoting peace. Trusting the government’s promise, the Las Palmas families signed on to the deal. 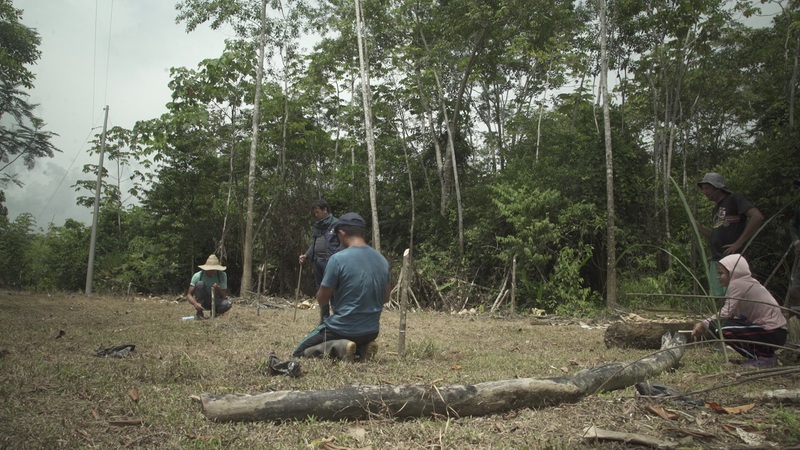 They voluntarily destroyed their coca fields, their primary source of income. They did so because almost all had experienced the violence that resulted from coca farming. The farmers believe that the Colombian government would never invest in schools or infrastructure in a coca-producing region. They were tired of army raids and guerrilla extortion and paramilitary massacres. Many had lost siblings, children, parents or spouses. They wanted something better for their children. But almost a year after destroying their coca fields, the families are still waiting for government assistance. That is part of the reason that a transition to an alternative crop has been too challenging for many. If a farmer in the Catatumbo wishes to plant coca, there is help for him immediately. A field full of coca serves as a form of social credit. “[If you are growing coca] the store will give you what you need, you don’t have to pay upfront for any of the seeds, and workers will come help you pick the crop without being paid, because everyone knows in three months, you’ll turn a profit,” explained Alex, one of the former coca farmers, who asked that America not use his last name. “It is very easy to judge people for working with [coca], but we need to realize [coca farming] is a necessity.” For people planting legitimate crops, it is a struggle to make ends meet. Alex, a signatory to the 2015 Havana accords, voluntarily cleared his fields of coca. Now he feels betrayed: “We’ve seen the conflicts because of the drug. We’ve seen many families killed that were working with the drugs. “The peace is a lie; the Catatumbo is as bad today as it was 10 years ago. Since the FARC left, there has been a lot of killing. And of course, the FARC continues, only by other names." To that end Mr. Duarte oversees several J.R.S. projects assisting local farmers in planting crops such as yucca, cacao, corn and bananas, as well as raising animals such as pigs and chickens. While in the Catatumbo, Mr. Duarte spends his days reaching remote huts and land plots, visiting with participating families and inspecting progress. An agriculture specialist, Mr. Duarte often shows former coca farmers better ways to plant. Mr. Duarte explains, “There’s technical assistance now. They aren’t just playing around with what they’ve always done, but we help them ensure a higher quality of their products.” Regardless of the quality of the products, however, getting goods to market remains the largest hurdle to the transition away from coca. The poor quality of the roads, the remoteness of the location and the insecurity of the region all make it difficult to attract investment or to get products out to sell. There are still coca fields all around the Catatumbo. You can see them from the road, stretching along the sides of hills, seeming to go on at times for as far as the eye can see. With the farmers who grow coca continuing to live well day to day, the pressure on the farmers who have chosen to leave coca cultivation behind is immense. Complicating the picture even further is the election of a new Colombian president. Right-wing candidate Iván Duque won in a landslide on June 17. During the campaign, Mr. Duque promised to return to a hard line on the guerrillas. Most worrying for the farmers of the Catatumbo, he refused to rule out a return to aerial fumigation, a controversial U.S.-funded policy accused of causing cancer in affected areas. Spraying coca-producing regions with chemicals also destroys the ability of farmers to grow anything else in the area. Any return to fumigation or an increase in violence could destroy the fragile progress J.R.S. and its partners in the region have accomplished. The Catatumbo faces an uncertain future. What is certain is that a group of farmers, with support from the church, has come very far down a very hard road toward eliminating coca production. And yet there is still no guarantee they will see any permanent reward for the effort. Should they succeed, however, there will be a real example for farmers across the region to leave coca, and the violence that accompanies it, behind. Another example of Americans causing problems in South America. So much suffering fueled by Americans wanting their pleasures no matter what the cost to others, especially poor others. Legalize it all. Let them have all the cocaine the market will bear until their brains explode. I'm a free market capitalist in this case. No government regulation. Prohibition only fuels organized crime. P.S. If a druggie gets tired of destroying his or her self, free rehab. It'll be cheaper than the futile War on Drugs. I just talked with a customer from Colombia. He was talking about the problems in the country. The street corners are full of young girls from Venezuela who are prostituting themselves for $10-$15 to get any food they can. Things are desperate in Venezuela and has spilled over to Colombia, He says men from North America and Europe are going there to take advantage of these young women. This article also appeared in print, under the headline "Colombian farmers seek to plant peace in former coca fields ," in the September 17, 2018 issue. Antonio De Loera-Brust, a former America Media O’Hare Fellow, visited Colombia in June as part of Jesuit Refugee Service/USA’s Journalism Encounter.